In this exercise, listen carefully to the short conversation and question on the recording, and then choose the best answer to the question. You should pay particular attention to negative expressions. 1. (A) He was on time. (B) He’s sorry he was late. (C) He doesn’t know why he was late. 2. (A) She’s sorry she brought the book. (B) She remembered to say she was sorry. (C) She forgot the book. (D) She didn’t remember the ring. 3. (A) The baby’s nodding off. (C) The baby’s on the way home. (D) The baby’s just waking up. 4. (A) He wants to go by himself. (B) He isn’t going on the trip. (C) He has a large number of friends. (D) He isn’t traveling alone. 5. (A) She does not have time to park the car. (B) She has some free time. (C) She has not been to the park in a while. (D) The park is too wild. 6. (A) He closed the windows. (C) The windows were open during the storm. (D) He saw the rain through the windows. 7. (A) She’s certain the plant’s alive. (B) She’s not sure what happened to the plant. (C) She planned to throw it out. (D) She’s sure the plant should be thrown out. 8. (A) The apple is good because it’s sweet. (B) There is an apple in each suite. (C) The apple doesn’t look good. (D) The apple is sour. (B) It costs a lot. (C) It has a few problems. (D) It’s hard to find. 10. (A) She must leave the rock there. (B) She needs a big rock. (C) She should take the rock with her. 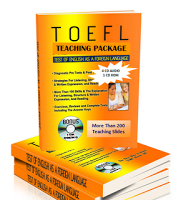 Need Answer Keys and Audio For This TOEFL Exercise, Click Here. Thanks for publishing this details. It's good that such blogs exist.